PFC James H. Lysaght (WG) was deleted from the crew before it arrived at Molesworth. F/O Asa H. Wyman (N) and F/O Junius Leonhirth (B) joined the crew at Molesworth. 1Lt Donald R. Walter (P) - Upgraded to a lead crew position following his first seven missions. 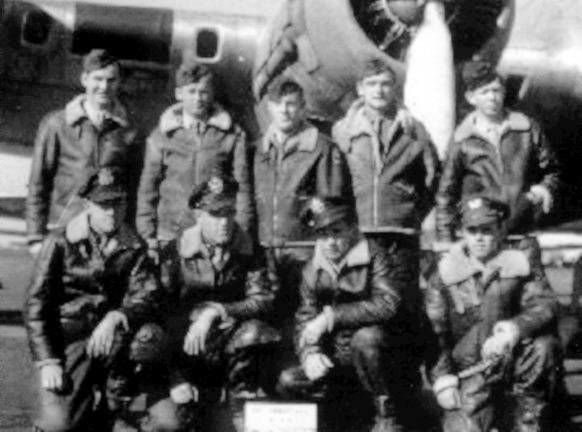 On aborted mission #315 (15 Feb 1945), with 1Lt Werner Goering (P), B-17 crashed just after becoming airborne and exploded about ten minutes after crashing. All crewmen survived the crash but four had injuries. Completed 19 credited missions on 14 April 1945 (Mission 359). 2Lt Everett H. Thornton (CP) - Flew on seven missions with 1Lt Walter (298B, 299, 300, 302, 303, 304, 356) and 16 other missions: As CoPilot with other Pilots (325, 328, 330, 332, 338, 342, 359, 353, 364); As First Pilot (343, 350, 351, 352, 358, 360, 362). Completed 23 credited missions on 25 April 1945 (Mission 364). F/O Asa H. Wyman (N) - Flew on five missions with 1Lt Walter (297, 298B, 300, 302, 304) and 26 missions with other Pilots (323, 324, 325, 326, 327, 328, 331, 332, 335, 336, 338, 339, 340, 341, 342, 347, 350, 351, 352, 353, 357, 358, 359, 360, 362, 363. Completed 31 credited missions on 20 April 1945 (Mission 363). F/O Junius Leonhirth (B) - Flew on 4 missions with 1Lt Walter (297, 298B, 299, 300) and 30 missions as Navigator with other Pilots (310, 311, 312, 313, 314, 315, 316, 320, 321, 323, 325, 326, 328, 329, 330, 334, 335, 336, 338, 339, 340, 344, 354, 355, 356, 358, 359, 360, 362, 363). Completed 34 credited missions on 20 April 1945 (Mission 363). 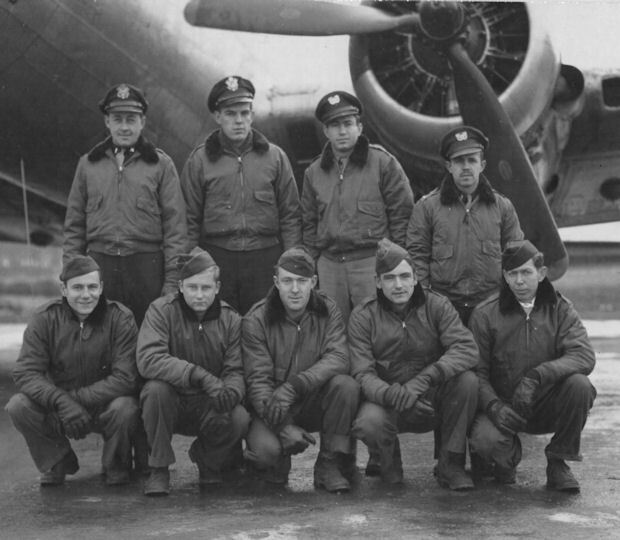 S/Sgt Karl T. Schroeder (E) and T/Sgt Robert F. Kasik (R) - Flew on twelve missions with 1Lt Walter (297, 298B, 299, 300, 302, 303, 304, 311, 335, 338, 351, 356, 359) and 2 missions with other Pilots (252, 262). Completed 14 credited missions on 17 April 1945 (Mission 262). S/Sgt Norman R. Sexton (BT) - Flew on eight credited missions with 1Lt Walter: (As Ball Turret Gunner - 297, 298B, 299, 300, 302, 303, 304); (As Waist Gunner - 339) and 17 missions with other Pilots: With 1Lt Lawrence E. Poole (11 missions - 315, 323, 325, 327, 329, 338, 339, 342, 346, 349, 351); With four other Pilots (6 missions - 319, 343, 344, 350, 352, 358). Became a member of the Caterpillar Club on mission 315, 15 February 1945, when eight members of the crew made successful parachute jumps. The Pilot, 1Lt Lawrence Poole, and Engineer, T/Sgt Rayford Pullen, attempted a normal landing at RAF Lakenheath, Suffolk, England but made a wheels up landing to avoid hitting workmen on the runway that was under construction. Both were uninjured. Completed 25 credited missions on 11 April 1945 (Mission 358). S/Sgt Joseph J. Meade (WG) - Flew on twelve missions with Lt Walter: (As Waist Gunner - 297, 298B, 299, 300, 302, 303, 304, 335, 338, 351); (As Tail Gunner - 356, 359) and 9 missions with other Pilots: (As Waist Gunner -313); (As Togglier - 314, 316, 320, 321, 325, 329, 352, 362). Completed 21 credited missions on 17 April 1945 (Mission 362). Sgt Billie E. Hudler (TG) - Flew on eight missions with 1Lt Walter: (As Tail Gunner - 297, 298B, 299, 300, 302, 303, 304); (As Waist Gunner - 356) and 10 missions as Tail Gunner with other Pilots (313, 315, 318, 319, 338, 339, 351, 352, 360, 363). Completed 18 credited missions on 20 April 1945 (Mission 363).